FILE - G-7 leaders, from left, President of the European Commission Jean-Claude Junker, Canadian Prime Minister Justin Trudeau, German Chancellor Angela Merkel, President Donald Trump, and Italian Prime Minister Paolo Gentiloni, pose for a family photo at the Ancient Greek Theater of Taormina, May 26, 2017, in Taormina, Italy. Just hours earlier President Trump told American troops stationed in Sicily he had strengthened bonds with allies. That isn't how Europe leaders and most of the continent’s media see it. German Chancellor Angela Merkel spelled out publicly her fears that the traditional western alliance is now under threat both from the Trump presidency and Brexit. President Donald Trump speaks to U.S. military troops and their families at Naval Air Station Sigonella, May 27, 2017, in Sigonella, Italy. European reaction — especially in the key capitals of Berlin and Paris — to the Trump visit is very different from the White House’s characterization; and "success" isn’t a word being used. European officials say they now are convinced Europe will have to go it alone more — something they expected would be the case after Trump was elected. The Europeans had hoped Trump’s visit might mark a reset in transatlantic relations roiled by his election — that the U.S. president would be persuaded to see the world through their eyes more. But from Brussels to Sicily, there were uneasy smiles, awkwardness and no disguising rifts on a range of issues — from trade and immigration to sanctions on Russia and climate change. German officials told Süddeutsche Zeitung that Trump and his aides were under the impression America had separate trade deals with each individual EU country. 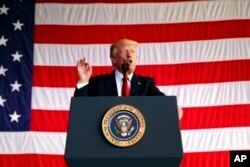 France’s Le Monde newspaper said: “During this visit, President Trump maintained his line ‘America First,’ refusing to take a step to improve U.S.-European relations.” It faulted him for failing to make a clear statement reaffirming Article 5 of the NATO Treaty, guaranteeing mutual assistance in the event of armed attack, and for lecturing European leaders on financial burden-sharing. 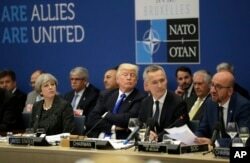 From left, British Prime Minister Theresa May, U.S. President Donald Trump and NATO Secretary-General Jens Stoltenberg listen to Belgian Prime Minister Charles Michel as he speaks during a working dinner meeting at the NATO headquarters during a NATO summit. The German magazine Der Spiegel pounced on the closing photo-op of a midweek meeting between Trump and newly elected French President Emmanuel Macron in which the two men appeared locked in a hand-wrestling match as a visual metaphor of the U.S. president’s European trip. “The Frenchman grabbed Trump's hand and squeezed hard,” the magazine noted. “Trump squeezed back. For a moment, they looked like opponents locked in a wrestling match. Trump wanted to let go, but Macron squeezed even harder until his knuckles turned white,” was the Der Spiegel’s description of an iconic almost sumo-like standoff between the two leaders. Other European media outlets focused their attention on the shove President Trump gave Montenegro’s prime minister, Dusko Markovic, in order to position himself to the front for a group photo-opportunity of NATO leaders. 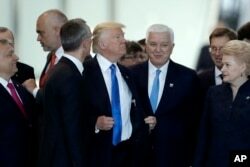 Montenegro Prime Minister Dusko Markovic, center right, after appearing to be pushed by Donald Trump, center, during a NATO summit of heads of state and government in Brussels, May 25, 2017. Aside from body-language, European media attention Saturday focused on the brevity of the communiqué concluding the two-day G-7 summit in Sicily Saturday — half-a-dozen pages long, compared to 32 pages last year — which many editorial writers saw as advertising the absence of consensus between the U.S. and the other G-7 members. Trump’s refusal to reaffirm the 2015 Paris pact on climate change aimed at reining in greenhouse gas emissions was the headline dispute of the G-7 summit in the cliff-top town of Taormina on Sicily’s Ionian coast, but European commentators noted that across the board there was very little meeting of minds. Italian newspapers noted the disappointment of Prime Minister Paolo Gentiloni in his efforts to get U.S. backing for a new partnership between G-7 nations and Africa involving aid and investment in a bid to stem the flow of migrants across the Mediterranean. European newspapers have now taken to dubbing the G-7 as "G-6 plus one" — a characterization prompted partly by German Chancellor Angela Merkel’s remarks on the summit deadlock over climate change. “The whole discussion on the topic of climate was very difficult, not to say very unsatisfactory,” Merkel said as the summit of the leaders of the world's most economically advanced nations was drawing to a close. “Here we have a situation of six against one, meaning there is still no sign of whether the U.S. will remain in the Paris accord or not," she added. 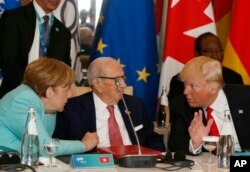 U.S. President Donald Trump and German Chancellor Angela Merkel speak with Tunisian President Beji Caid Essebsi as they attend a round table meeting of G-7 leaders and Outreach partners at the Hotel San Domenico in Taormina, Italy, May 27, 2017.